The surfaces of the still life objects enjoy a subtle and sophisticated rendering, similarly to the flowers. However, while the petals evince a more or less two dimensional representation, the fruits imitate spherical three dimensional forms; the illusion of three dimensionality relies heavily upon light and shade manipulation, only in global rather than local terms. 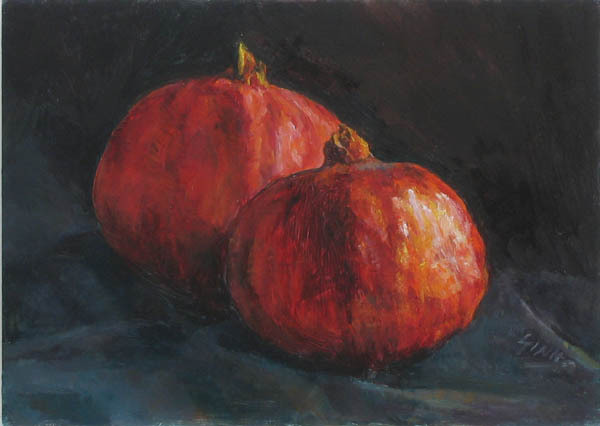 Here the artist’s technique of handling light and shade finds its full expression, creating full-bodied forms; the viewer is encouraged not only to “touch” the skin of the lemons, pomegranates and Brussels sprouts but also to “feel” their weight. The realism is particularly teasing because it is often on the verge of transmuting into impressionism, brush strokes appearing ready to smudge the colors. Perhaps the stylistic evolution mentioned in the previous review is not over yet. I would not go as far as calling the tendency of impressionistic generalization as a generic compromise or collapse, but the evidence of some sort of synthesis is there. 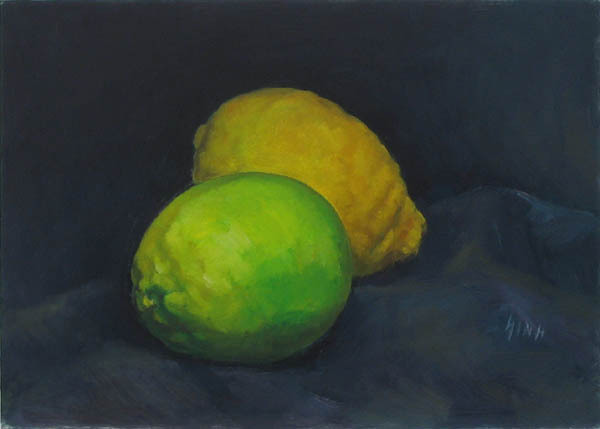 For instance, in the two limes piece the tip of the yellow fruit in the background is realistic (resembling rhinoceros skin) whereas the tip of the green one in the foreground is much more impressionistic, with wide clearly visible brush strokes describing how light lands on the surface and defines the object. The notion of weight extends to the backgrounds too. The ethereal flowers accord with abstract airy atmosphere, but the fruits need to actually lie on something. The artist chooses a basic setting resembling a wall and floor (or table) conjunction, with linear and angular characteristics which complement the globular forms of the objects without overpowering the latter. 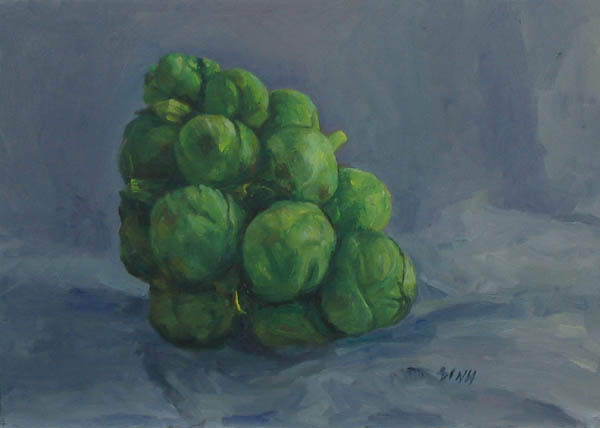 The dark gray bluish tones consume all the light, leaving a few dashes for the still life — but eloquent, central dashes. Overall, the fruits and vegetables appear to lay in a nook, or a lair, a stylized environment evidently composed by the artist. The focus in these paintings is on the relationship between the various subjects rather than between them and the background. General color schemes are bolder: exotic red-black and yellow-green combinations enliven the quiet compositions. Although the florals display powerful tonal clashes (such as the opposing reds and greens), the human eye tends to ignore the green of the stems and leaves and focuses on the bright blooms. Perhaps we are not unlike insects, tempted by the flowers’ brightness, — only we bring death by plucking them whereas the insects bring life by pollinating them. Here the colors declare the strong sweet or sour taste of fruits that were meant to be plucked. In some ways, SINH’s still life reclaims some of the zest lost in melancholic flowers.